Here are some helpful tips for improving the link popularity and search engine ranking of your website by creating successful link exchanges with LinkMachine. Most webmasters would rather receive a personalized e-mail that shows that the sender is familiar with their specific website, rather than a generic form letter. When you send out your link exchange request e-mails, make sure to add a personal touch to each one - complement a particular feature of the website, mention what kind of website it is, call it by name. Personalizing an e-mail before sending it out can take just a moment, but can make a big difference in how likely it is to generate a positive response. Webmasters are most likely to choose to exchange links with your site if your site is relevant to their web site's audience. Also, the most effective link directories are those that are well organized and useful to your site's visitors. This means categorized links that are relevant to your visitors' interests, rather than a hodge-podge of unrelated links. The degree to which a link to your website can improve your website's PageRank depends on the PageRank of the page with the link on it. Because of this, many webmasters will pay attention to the PageRank of the link pages where you place the link to their site. New web pages start with a PageRank of 0, until Google finds out about them and indexes them. After adding a few sites in each category of your link directory, you may want to wait for a month or so until Google indexes your link pages and gives them a PageRank higher than 0, before adding a lot more sites. As soon as you've created your link directory, add links to your link page from your main site, preferably from your home page. You may even want to add a "links" link at the bottom of each of the pages on your website. It is only advantageous to other webmasters to exchange links with your site if the link page featuring their site is accessible, both to your site's visitors and to search engines. Also, the Google PageRank of your link pages will be best if you link to it from your site's front page, and any other pages on your site that have a high PageRank. You may want to place your list of link categories, or even all of your links, on your site's front page. The advantage to this is that webmasters like to have their link featured on another site's front page (which is liable to get the most traffic, and the highest PageRank, of any of a site's pages). The disadvantage of course is that it would take up space on your front page, but this can be minimized by displaying the links in a small font toward the bottom of the page, and only showing the site titles, not their descriptions. Adding your links to your front page is simple. Design your front page with an area set aside for links, and place the word #CONTENT# there. Then upload this file to LinkMachine as a page template. Set LinkMachine's Location of Link Pages and Filename of Main Link Page to the directory and filename that you'd like for your site's front page. LinkMachine will then generate your site's front page, adding your links to it. You can have it add just your list of link categories to your front page by turning off Feature Latest Sites and turning on Separate Page for Each Category in your Link Page Format settings. You can use these same techniques to add your links to any page on your site, not just your front page. You can place your links inside of a dynamically generated page (for instance, a page generated by a Php script) in the same way as described above for placing your links on your site's homepage. But rather than using your home page HTML file as a LinkMachine page template, use your dynamic script file. For example, if you're using Php scripts, you can place the word #CONTENT# somewhere in an HTML section of a Php script and use that script as your page template. 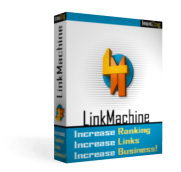 LinkMachine will then replace #CONTENT# with your links. In this case, make sure to set your Filename of Main Link Page to a name that ends in ".php". Unfortunately, mishaps do occur... and sometimes a data backup can keep a mishap from being a catastrophe. Occasionally web hosting providers have been known to lose their customers' files. So just as you'd keep backups of your web pages, it's a good idea to back up your LinkMachine data. It's simple and fast to download a data backup. Toward the bottom of the Settings page is a link to download the data file. Should you ever need to restore a backup, there is also a form for uploading a data backup to your website.